Kihei Sands Beachfront Condo A5 on Maui's Beautiful Sugar Beach! Aloha and Welcome to Kihei Sands Beachfront Condominiums Condo A5 in sunny South Maui! Condo A5 has a contemporary Pacific Coastal style and recently completed a 2 month renovation. Along with adding a whisper quiet AC system, the remodel paid close attention to detail, using the finest materials and craftsmanship for quality upgrades to pamper our guests. Kihei Sands Condominium sits directly on one of Maui’s best beaches, Sugar Beach. From our oceanfront pool and barbecue patio area you can practically touch the beach - clean, sandy, unpopulated, and stretching for miles in either direction. Couples, families and groups will find it the perfect place for rest and relaxation. Our Patio area here at Kihei Sands is one of our most enjoyed amenities. Enjoy each morning with fresh brewed coffee or each evening watching the awesome Sunset while you grill dinner. Fabulous views from our patio include turtles, whales (when in season), and last but not least our Spectacular Maui Sunsets!!! Our Patio is for all to enjoy, and it’s a small enough complex that you can get to know other guests during your stay which portrays our Ohana (Family) Atmosphere. Please come and join us at our Kihei Sands Ohana. Kihei Sands has thirteen 1 bed/1 bath condos located on the first of only 2 levels and only 30 condos total in the whole complex . Our beautiful 1 bedroom 1 bath units are upgraded and fully equipped with everything you need to feel right at home. 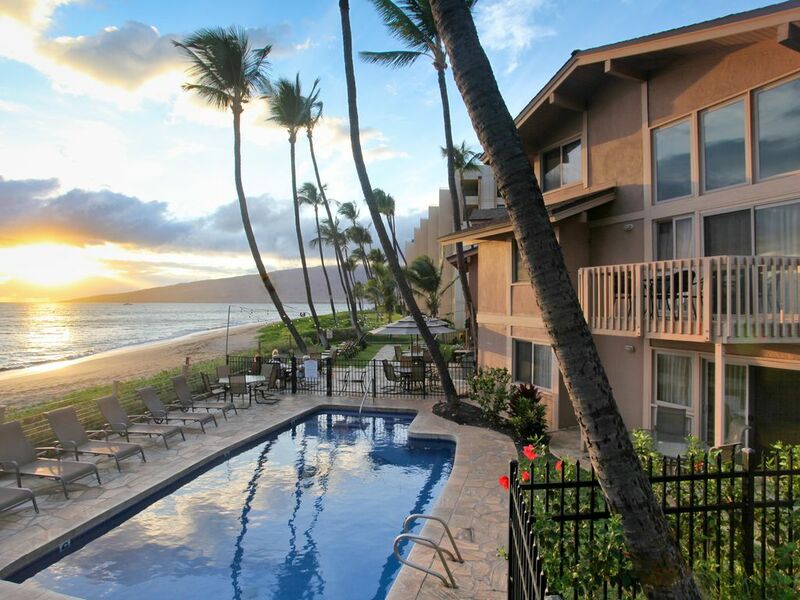 Because we offer one, two, and three bedroom units, families, friends, wedding parties, honeymooners, reunion groups, and senior citizens choose to enjoy a stay together at Kihei Sands Beachfront Condominiums. For nearby dining and shopping options, a small general store and a great sandwich shop are located next door. A fresh fruit and vegetable market with Maui produce, breads, cheeses and salsas is a short five minute walk down the beach as well as an ABC store and the best Shave Ice on the island. There are numerous dinning and shopping options within a couple miles of Kihei Sands. Our central location makes it easy to access all that Maui has to offer. It was great staying at Kihei Sands. Room was clean and updated. The new staff made you feel right at home. We met old friends we see once a year. Can't wait until next year! We had a great stay at Kehei Sands, the condo was clean and had everything we needed for cooking. Front desk was very helpful and able to help with discounts to local attractions. Ocean access was fantastic and not that busy. Condo is centrally located on the island so we weren't very far from anything. Would definitely return for a future visit! my only complaint would be that they were doing construction at the condo across from us and started way to early in the morning but i am sure that isn't always an issue! Mahalo for your 5 star review and for staying with us at Kihei Sands unit A5. Being feet from our stunning, quiet beach can't be beat! We apologize for any inconvenience you had with morning workers~ we will be sure to check their start time hours in the future. It was a pleasure having you as guests and we hope you return for a visit soon. Until then, much Aloha heading your way! We wish we would have stayed here for our full trip in Hawaii. The unit is clean, quiet and has a great beachside location. It's also pretty spacious for two people. The pool was generally quiet and warm. We loved chilling at our Lanai in the morning and seeing the sunrise. The bed was super comfortable and the rental company let us use a guidebook for Maui during our stay. If you don't have a car, this location may be a bit difficult because you do want to drive further south to the restaurants and shops in Kihei. We are thrilled that you enjoyed a great five-star stay with us! We hope to welcome you back again for another great experience at Kihei Sands. We were recommended Kehei Sands by friends who stayed here for 2 weeks last summer. This place doesn't disappoint! Perfect location for strolling the beach or to sit back and enjoy the view from the pool or lounge chair. Easy access down to the beach. Also easy access to leave the property by car and go explore. We would choose Kehei Sands for another trip to Maui. Mahalo for taking a moment to share your comments! We are delighted to hear you enjoyed your stay at our resort. Our goal is to provide our guests with a tranquil place to relax and unwind, while still enjoying all that Maui has to offer. We hope to welcome you back again! Our stay in A5 this last weekend was lovely. The condo is lovely. The bed is comfy. Just what we needed. Quiet area. Sugar beach is great. We will definitely rent this condo again if it available when we want to run away again. Our only problem we had was when we returned from dinner there were no parking spots for us. We figured out a place to park and the next morning discovered there were 8 vehicles without parking passes. Other than that glitch it was great! Aloha! We are glad you enjoyed your stay and plan on coming back to see us when you feel the need to escape again! Thank you for the heads up on the parking situation. We do try our best to make sure that only authorized guests use the lot, and that all guests read their contracts and use their parking passes. Occasionally our late arrivals don't dig those out until the following morning. We look forward to seeing you again in our little corner of paradise!